I've been experimenting with using Y-permutations to solve the 2x2 cube as described here. I ended up with the cube solved but for a single face where the opposite corners were swapped and disoriented. 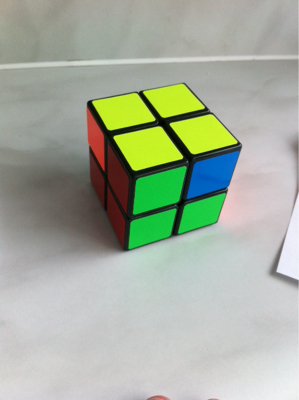 I managed to solve the cube, but I wonder if there is a shorter algorithm to accomplish this task. If you're using Y-perms, then simply rotate a face containing one of the corners 90 degrees, to position them opposite each other. This is called a setup move. Doing so puts the two corners opposite each other, and a Y-perm will then swap the correct corners. You can then undo that setup move after completing the Y-perm by rotating the face back in place.